Powerplay Power Washers for Today's Dirt Warriors muscle car looks. Refined precision engineering. A perfect synergy of performance and style, our pressure washers deliver the power you need to tackle any residential and commercial cleaning job. PowerPlay pressure washers are built using best-in-class components that can withstand rugged use from any dirty job you throw its way. Putting the muscle behind the name is the proven strength of engines from Honda or Briggs & Stratton, and pumps from Annovi-Reverberi. An innovative motorsports-inspired chassis design gives these machines a Detroit muscle car cool factor. Engineered for comfort and stability thanks to our anti-vibration system (PAVS), the ergonomic design includes a premium welded roll cage frame and oversized wheels for great maneuverability. PowerPlay machines can handle any cleaning job from siding and windows to stripping paint or power washing vehicles. Our machines are built to outperform and outlast the competition. 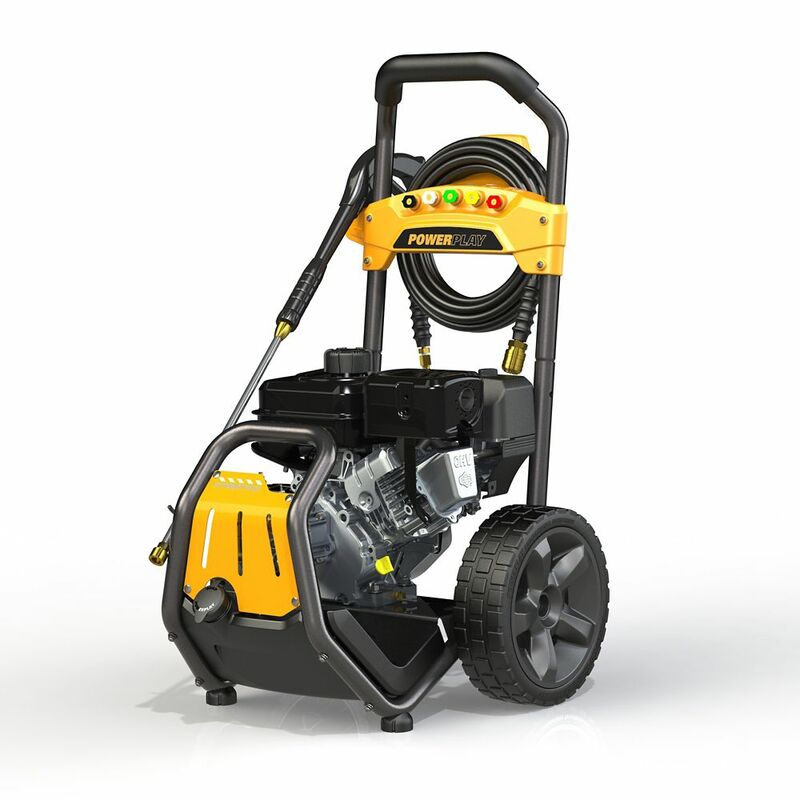 This Pulsar Gas Pressure Washer offers a 180cc, 5-HP OHV 4-stroke engine and an Annovi Reverberi 3-piston axial cam pump (that pushes 2.3 GPM to create 6210 cleaning units). Add a powder-coated 1 1/4-inch tubular steel frame, a fold-down handle for compact storage, hose and accessory storage, a spray gun, lance and 4 Quick Connect nozzles, and you've got everything needed to get any job done! This impressive power washer sits on large, 10-inch, no-flat tires for excellent mobility, and also offers Quick Connect high-pressure spray nozzles as well as an onboard soap reservoir and low-pressure soap nozzle for fast and easy application of your favourite pressure washer-safe cleaning solution. This 3100-PSI Gas Pressure Washer features a 208cc, 7HP OHV 4-stroke engine and an Annovi Reverberi, brass head, 3-piston axial cam pump (pushing 2.5 gallons of water per minute to create 7750 cleaning units). Other special features include a powder-coated, 1 1/4-inch tubular steel frame, a fold-down handle for compact storage, onboard hose and accessory storage for the 30 ft. braided high-pressure hose, a spray gun, lance and 5 Quick Connect nozzles. The Quick Connect Turbo Nozzle blasts a rotating cone of high pressure water on the toughest tasks from every angle. There are also two separate reservoirs allowing for the use of two different pressure washer-safe cleaning solutions at adjustable feed rates. Karcher's G 3200 XH gas pressure washer was designed from the ground up to meet the requirements of homeowners who demand professional level cleaning results, maximum durability and a user-friendly work experience. The unique folding frame makes the unit easy to lift and transport, with tie down slots to keep everything anchored during transport and protected from damage. Powered by Honda. Driven by a powerful Honda 300cc engine, the G 3500 OCT is the perfect work companion for contractors and demanding users. Equipped with a three piston crankshaft (triplex) pump with professional-grade unloader valve, this unit can handle the largest and most challenging cleaning assignments. Pros will appreciate the 50ft steel-braided rubber high pressure hose, pneumatic tires with metal wheels and durable welded frame. Streetrod 2800 PSI 2.4 GPM Gas Professional Pressure Washer with 212cc Horizontal Engine and AR Axial Pump Powerplay Power Washers for Today's Dirt Warriors muscle car looks. Refined precision engineering. A perfect synergy of performance and style, our pressure washers deliver the power you need to tackle any residential and commercial cleaning job. PowerPlay pressure washers are built using best-in-class components that can withstand rugged use from any dirty job you throw its way. Putting the muscle behind the name is the proven strength of engines from Honda or Briggs & Stratton, and pumps from Annovi-Reverberi. An innovative motorsports-inspired chassis design gives these machines a Detroit muscle car cool factor. Engineered for comfort and stability thanks to our anti-vibration system (PAVS), the ergonomic design includes a premium welded roll cage frame and oversized wheels for great maneuverability. PowerPlay machines can handle any cleaning job from siding and windows to stripping paint or power washing vehicles. Our machines are built to outperform and outlast the competition.